MENANDS -- Yoga isn’t just for people: goats, dogs and now cats are joining in. Each month, the Mohawk Humane Society in Menands hosts a Meowmaste Yoga with Cats class. “It fills up within a day [of being announced] or sometimes less,” said Vicki Brignati. 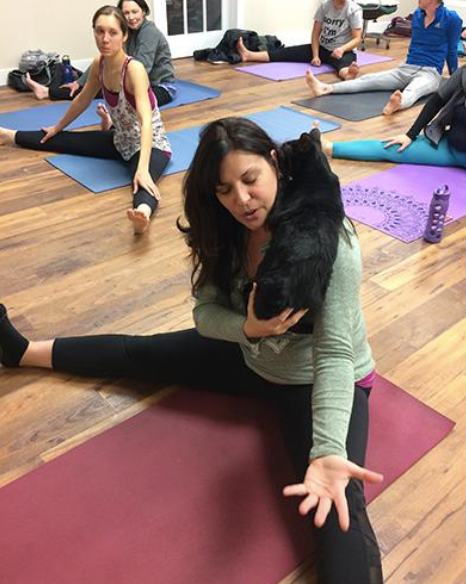 She works full time as a yoga instructor at The Hot Yoga Spot in Clifton Park but wanted to do something to help out the Humane Society. Brignati reached out to the Society about starting cat yoga and, according to Marguerite Pearson, the marketing and communications manager, the Society was just starting to look into making cat yoga feasible. Brignati teaches an all-levels class, so it’s not intimidating even for beginners.